Service provision to clean our streets has been cut. The result is we live in a dirty place. We need you to join our community effort to voice that this is not acceptable. Gemma Mogg and Amanda Kamin, working with the Loughborough Junction Action Group (LJAG), have started two campaigns #notadumpingground and #takingprideinlambeth to share dissatisfaction with the state of our streets and rubbish collection services. Recently our rubbish collection services have been greatly reduced and our local streets are litter covered and fly-tipped as a result. We would like to encourage you to join our campaign and raise rubbish collection in our areas as a priority. We need our streets cleaned properly and swifter action taken against those who flytipp or do not otherwise dispose of rubbish correctly. Recently our rubbish collection services have been greatly reduced and our local streets are litter covered and fly-tipped as a result. 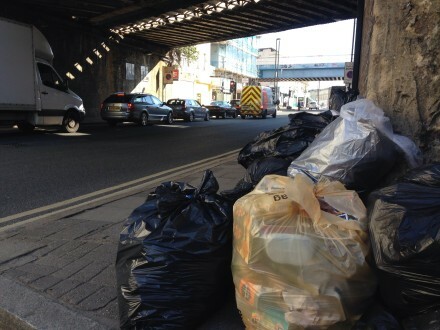 To report fly-tipping please log onto http://www.lambeth.gov.uk/forms/report-dumped-rubbish-form. Report to the same address above if rubbish is left on your street after it is supposed to be cleared. You can also tweet photos to Lambeth Council @lambeth_council and share your dissatisfaction with the current state of collections through #notadumpingground and #takingprideinlambeth. You can also complain directly to the following individuals responsible for rubbish collection in our area. Unfortunately, there is a charge of £20 for collecting up to four separate items or four bags + an additional £5 for each additional item or bag. To arrange collection ring 020 7926 9000. There is now a free collection service from Emmaus for furniture and large electrical items but they must be in a good and repairable condition. To book a collection call Emmaus Lambeth 020 8761 4276 or log into the Emmaus website www.emmaus.org.uk/lambeth. Lambeth will collect with weekly rubbish collection but there is an annual fee, currently £45 + £5 for the large green recycling bags and £15 for a roll of biodegradable plastic bags. It is only through a joint community effort, that we can increase the pressure and bring about the services provision that we so desperately need. Thank you in advance for your support.